When young magicians Carter and Sadie Kane learned how to follow the path of the Ancient Egyptian gods, they knew they would have to play an important role in restoring Ma’at—order—to the world. What they didn’t know is how chaotic the world would become. The Chaos snake Apophis is loose and threatening to destroy the earth in three days’ time. The magicians are divided. The gods are disappearing, and those who remain are weak. Walt, one of Carter and Sadie’s most gifted initiates, is doomed and can already feel his life force ebbing. Zia is too busy babysitting the senile sun god, Ra, to be of much help. What are a couple of teenagers and a handful of young trainees to do? There is possibly one way to stop Apophis, but it is so difficult that it might cost Carter and Sadie their lives, if it even works at all. It involves trusting the ghost of a psychopathic magician not to betray them, or worse, kill them. They’d have to be crazy to try it. Well, call them crazy. With hilarious asides, memorable monsters, and an ever-changing crew of friends and foes, the excitement never lets up in The Serpent’s Shadow, a thoroughly entertaining and satisfying conclusion to the Kane Chronicles. I love Rick and his books!! Been reading since the beginning!! 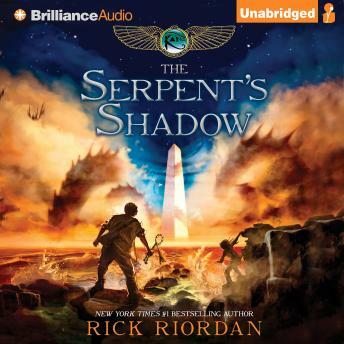 Amazing!it is a cooler version of Percy Jackson with the brother and sister telling the story it is really gets stuck in your head (the good way )Just listen to it you will see what I am talking about!